When figs start to mature you know that you’re heading towards the end of Summer in Lebanon. Like everywhere else in the Eastern Mediterranean fig trees form the landscape. You’ll find them growing in a field, by a wall, near a house, most often unattended and wild. They give generously and you’ll always pick enough to eat, cook, or bake; their fruit, ripe, soft and tender melts as you eat it. The best figs of course are the one you eat standing under the tree while you’re eyeing the next one to grab. 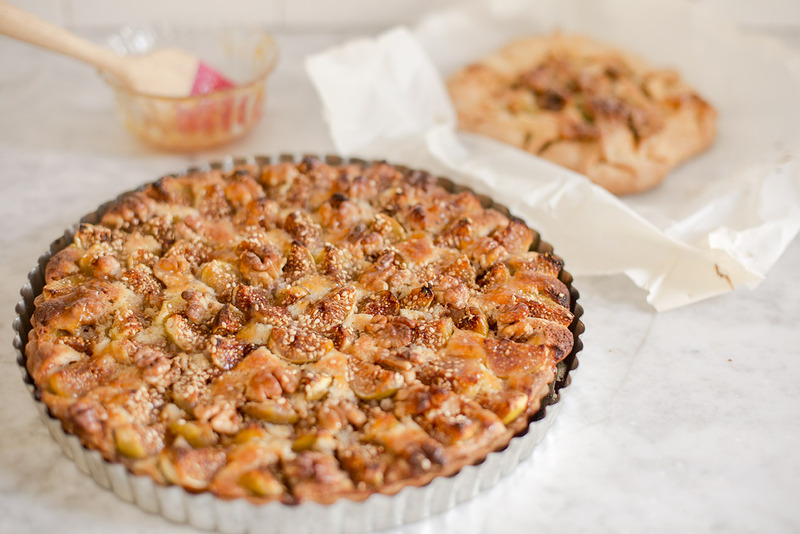 This tart is based on a French classic, sweet pastry filled with an almond cream or frangipane. To give it that particular flavour reminiscent of the fig jam from Lebanon, I added aniseed for aroma and sesame for taste. Top and tail the figs and slice them into quarters. In a food processor, pulse the flour, sugar and butter together until you get a crumbly mixture. Add the eggs and a few drops of vanilla extract and pulse a few short pulses until the pastry starts to come together. Transfer onto a work surface and knead lightly for a short time. The less you work the pastry the lighter it will be. Place the dough inside a plastic bag and refrigerate for 30 minutes. If you are in a hurry, leave it for 15 minutes in the freezer. Roll the pastry out to line a tart tin. Cover with baking parchment and leave in the refrigerator for another 30 minutes or 10 minutes in the freezer. Preheat the oven to 180ºC and prepare the frangipane. Cream butter and sugar in a food processor; incorporate the eggs one at a time. Rinse the aniseed and combine into the mixture. Cover the rolled pastry with baking paper and bake blind for 10 minutes; remove the paper and bake for another 10 minutes. When the pastry base is ready and out of the oven, let it cool for before adding the filling. Spread the almond cream on the pastry. 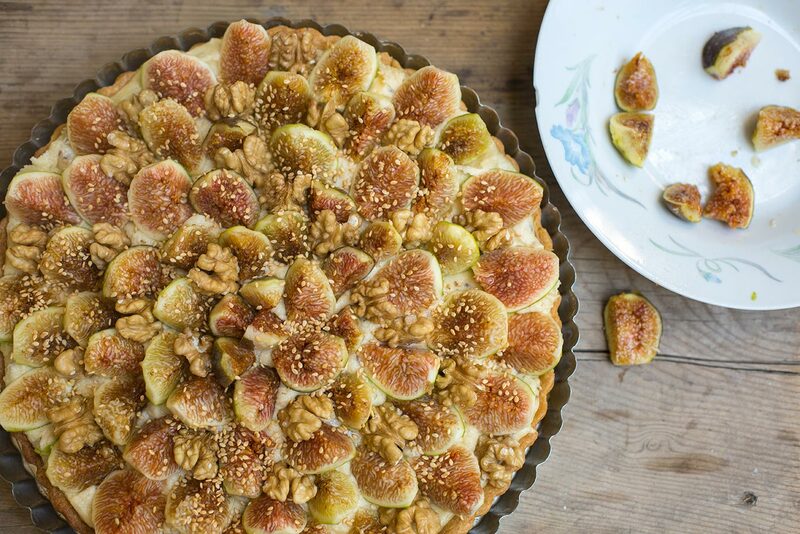 Arrange the figs in a circular fashion, starting with the outer layer and finishing in the centre. Dot the walnuts between the layers of figs. Sprinkle with sesame seed and bake for 40 minutes. The surface should become golden. Allow the pastry to cool before taking it out of the tin. Dilute 2 to 3 tablespoons apricot jam in water, sieve the bits, and using a pastry brush, coat the surface with a thin layer of jam.